Is Thanksgiving the only day in the year your family sits at the same table same time? Is your Thanksgiving family gathering a time when relatives meet to be once again mean to each other? Is Thanksgiving a time when you and yours eat enough food at one meal to feed a hundred Somali pirates? Is your Thanksgiving prayer one for a Buffalo Bills Super Bowl appearance and a quick dinner before the game? Stressed out from all the Thanksgiving hype and Black Friday? Take a deep breath and play this game with your guests before eating. It is a short quiz. If someone can answer all the following questions correctly they get to break the wishbone for a special wish come true. As we gather around the dining room table at home, my family and friends are subjected to this quiz and a history lesson as part of our prayer time. 1.) Looking forward to mashed potatoes? Where in the world were these tubers first provided as food? You get to wash dishes if you said Idaho or Ireland. Native people grew many kinds of potatoes including sweet potatoes domesticated by indigenous people in South America over 5,000 years ago. The French found the Opelousas Indian tribe in Louisiana eating and cultivating sweet potatoes in 1760. 2.) Butterball turkey anyone? 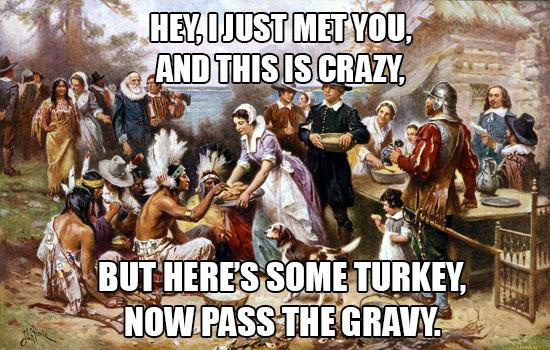 Who were the people first domesticating turkeys? It was not Ben Franklin, but he did suggest the turkey as the national bird. Spanish conquerors found a domesticated species of turkeys among Mexico's Native peoples in 1518. Wild turkeys could be found from Canada to Texas to Missouri. In 1613 that the Pilgrims wrote descriptions about turkeys they saw in the woods. 3.) Stuffing the bird? Using “Stove Top”? Where did the stuff stuffing is made of originate? Your stuffing may be made of cornbread and corn is a foodstuff from Native Americans. If you use oysters, apples, walnuts or cranberries in your delicious stuffing, you are eating foods from your Thanksgiving table Native Americans first used as a food source. 4.) Cranberries or blueberries anyone? Where were these first grown as a food? Cranberries, as well as blueberries, are native to the North American Continent and were introduced in 1647 to Europeans by the American Indians. 5.) Pass the green bean casserole. Who first brought green beans to the table? 6.) Are you having corn on the cob or off the cob in a bowl? This is an a-maizing place of origin. Some people call it corn. We call it maize. Corn has been grown in the Americas for at least 5,600 years according to Archaeologists estimates! There are many different types and colors of corn, including popcorn, but one of the more unusual varieties of corn is blue corn. The Hopi Indians in northern Arizona have grown the small ears of blue corn for thousands of years relying solely on rainwater for irrigation. They still plant corn in the rain runoff areas of the desert mesas. 7.) Of course we are having pumpkin or maybe a chocolate pie for dessert. Where were these foods first discovered by European illegals? One of the Mayas and Aztecs generous gifts to the world was the knowledge of the cacao tree. Without it we might be without Hershey's chocolate. Chocolate is made from the cacao tree fruit seed stretching back over 4,000 years. It was also used as a form of currency by the Central American Natives. Native Americans showed the settlers how to roast strips of pumpkin flesh over the fire. They used pumpkins to make desserts, stews, and soups. Did you do well on the test? I bet you got them all right after the first one. Without these Native American foods our Thanksgiving dinner would consist of salt and pepper on a saurkraut stuffed sheep. Are we thankful for Indian contributions to our meal? Another fond memory for me of a family Thanksgiving is when the meal was over. The friends we invited to the meal stole our stuff and went home. It was an historical re-enactment for Delaware Indians of today based on the First Thanksgiving meal the Lenape Indians provided for the starving immigrants. Well I am off now to make our Lenape Indian Corn Pudding. Interested in the recipe? Want to make a trade? I will give you the recipe for the lands of Scranton, or Wyalusing, Pennsylvania. Beautiful work that was done with creativity AND precision! So vibrant and absolutely stunning! The picture doesn't do it justice. Beautiful.